The Herring Gull is the largest gull regularly found in Tennessee from October through April, and the only one to sport pink legs and a yellow bill. It breeds across Alaska and northern Canada, southward to the Great Lakes, and along the Atlantic Coast to North Carolina. In winter, they inhabit the Pacific coast from southern Alaska to Mexico, and in the east, they are found across most of the eastern half of the United States, south into the Caribbean and Central America. Description: This large gull takes 4 years to reach adult plumage. When an adult, the wingtips are black with white spots, the back is light gray, the tail is white, the legs are pink, and the bill is yellow with a red spot on the lower mandible. In breeding plumage (February-September) the head is white. In non-breeding plumage (September-April), when the birds are more likely seen in Tennessee, the head and sides of the breast are variably streaked with grayish-brown. During its first winter, the birds have a black bill and are mottled brown all over. In their second winter, the base of the bill is pinkish with a black tip, the back has areas of light gray, and the tail is mostly dark. By the third winter, the base of the bill is yellow with a black tip, there is more extensive gray on the back, the chest and belly are white, the head is streaked with brown, and the tail is tipped with a wide black band. Sexes are alike in plumage but females are larger than males. Ring-billed Gulls are smaller, with yellow legs in adults, and a distinct black ring around a yellow bill. Immature birds have a thinner black band on the tail. Bonaparte's Gulls are much smaller, have white wingtips, and a white head with a dark spot behind the eye during the non-breeding season. The head is entirely black in breeding plumage. Habitat: In Tennessee, found on large lakes and rivers. Diet: Eats mostly fish and invertebrates, but also insects, birds, eggs, carrion, and garbage. Status in Tennessee: The Herring Gull is an uncommon, but regular migrant and winter resident in the state. It usually arrives by early October and departs by early May, and can be found in small to moderate numbers across the state, but more often in Middle and West Tennessee. The Herring Gull was nearly extirpated by plumage hunters and egg collectors in North America in the 1800s. Due to the protections provided by the Migratory Bird Treaty Act, numbers rebounded and by the 1960s, had exceeded historic levels. This may have resulted from added food resources provided by human landfills. The red spot on the adult's bill serves an important function. Young chicks peck at the spot, stimulating the parent to regurgitate food into the mouth of the chick. 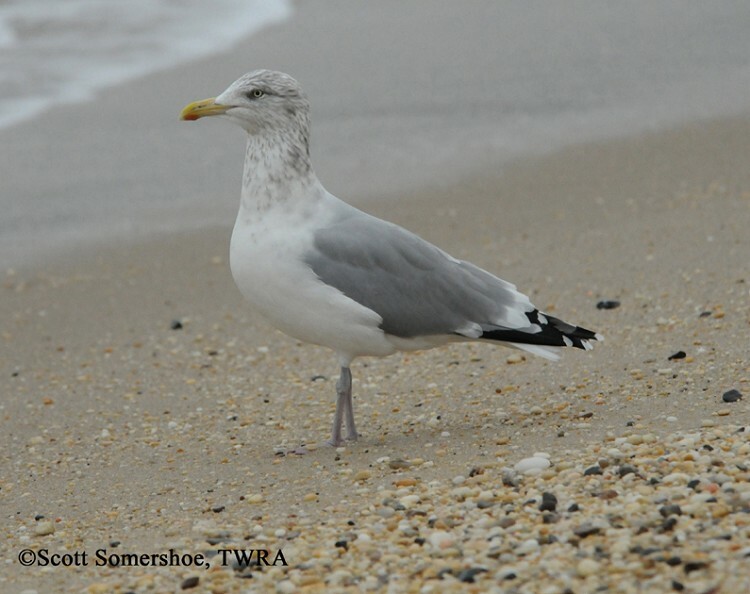 Herring Gulls are expanding their breeding range to the south along the Atlantic displacing Laughing Gulls in some areas, and Herring Gulls themselves are being displaced by the more aggressive Great Black-backed Gull in some parts of their northern range. In coastal areas, Herring Gulls eat clams. They open the shell by flying up into the air and dropping the clam on a hard surface, like a parking lot. 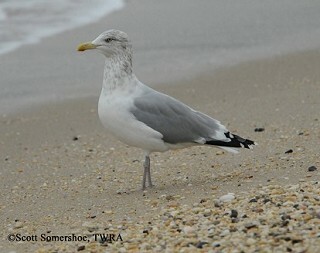 They will also steal food from other gulls, diving ducks, terns, and other species. The oldest known Herring Gull in the wild was 28 years old. Best places to see in Tennessee: Most likely found on large lakes and rivers in Middle and West Tennessee from early October through early May. Pierotti, R. J., and T. P. Good. 1994. Herring Gull (Larus argentatus). The Birds of North America, No. 124 (A. Poole, and F. Gill, eds.). The Academy of Natural Sciences, Philadelphia, PA, and The American Ornithologists' Union, Washington, D.C.